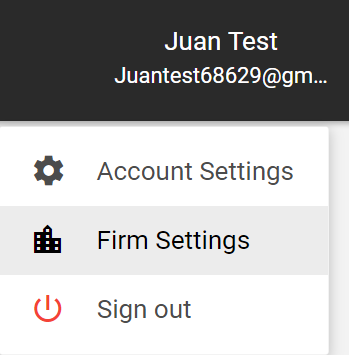 A quick tour on the Firm Settings interface of JuanTax. Firm Settings is the place where you could access basic information of your accounting/bookkeeping firm such as name, address and phone, as well as things like subscription details and staff. In order for you to go to Firm Settings, you’ll just have to click the Firm Settings option on the top right of the screen. Once you've managed to enter the Firm Settings page, you will be able to access the following menus: (1) Firm Information, (2) Subscriptions and (3) Staff. Firm Information - this section contains all the basic information of your accounting firm, such as Firm Name, Firm Address and Phone, as well as social media handle links (e.g. Facebook, LinkedIn). Subscriptions - Be able to pay your JuanTax subscriptions through credit cards like Visa and MasterCard. Staff - Be able to manage each staff of your accounting firm by adding them up as a member within your Staff section in JuanTax. Not only does this give you the ability of adding employees and search for each one accordingly, but it also gives you the option of assigning them with unique user role privileges in JuanTax.